With QB Philip Rivers throwing three first half interceptions, the Chiefs did not have to work all that hard to score a pair of first quarter touchdowns, one a catch by WR Tyreek Hill and the other a catch by WR Albert Wilson. While Los Angeles would respond with a HB Melvin Gordon touchdown, the Chiefs would enter halftime up 17-10. 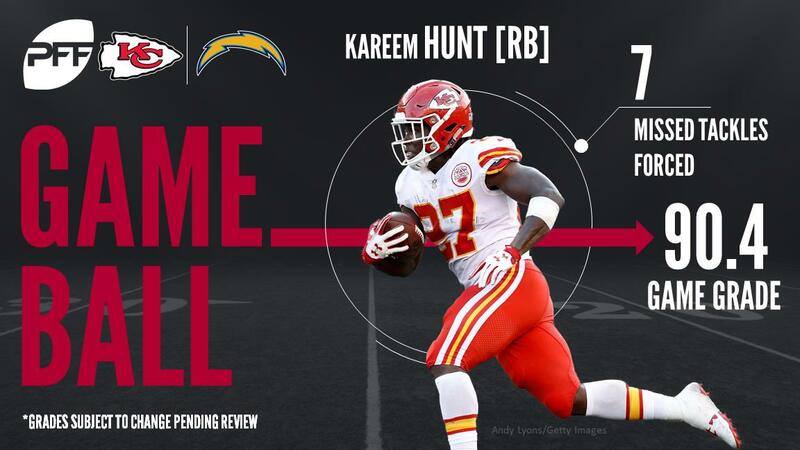 The Chargers would fail to score in the second half, while the Chiefs would add a HB Kareem Hunt 69-yard touchdown run to seal the game 24-10. With that, we give you our PFF exclusive takeaways from the contest for each team. Hunt looked like the best player on the field and sealed the game with a 69-yard touchdown run late in the fourth quarter. The Chiefs offensive line continued to give Hunt space to find holes and he took advantage, averaging over 10 yards per carry. The rookie gained 67 of his 172 yards after contact, and forced 7 missed tackles on the day. Smith wasn’t asked to do much, but delivered when he needed to, including on yet another perfectly placed deep ball on a deep cross to Tyreek Hill in the first quarter. The Chiefs offensive line had spurts where they struggled in pass protection, and Smith carefully took sacks on all 5 of his dropbacks under duress. With a heavy dose of quick game and screens, Smith attempted just 2 passes over 10 yards, but was efficient underneath, completing 83.3 percent of his throws that traveled less than 10 yards. It was another week of disruption for Jones, who finished with two quarterback hits on his 27 pass-rushes. Both hits got to Rivers in about two seconds, the first leading to a near-interception that was dropped. Jones also had a number of other wins that didn’t lead to official pressures while also adding a sturdy presence in the run game where he consistently held his gap and disrupted plays. One of the league’s best playmakers, Peters got onto the stat sheet with his first interception of the season while adding a pass breakup that nearly led to another. He showed his usual incredible feel for finding the football, twice peeling off his man to get his hands on an errant Rivers’ pass, one of which was his interception. Overall on the day, Peters was targeted seven times, allowing only three catches for 20 yards. It was a game where the stats did tell the story, as Rivers finished 20-for-41 for 237 yards and three interceptions, good for a passer rating of only 36.3. He got away with one other dropped interception by CB Marcus Peters as it simply was not Rivers’ day with regard to decision-making or accuracy. Rivers finished with a passer rating of 44.6 from a clean pocket and a rating of 18.8 when pressured. The Chargers had an efficient running game for much of the afternoon behind Gordon, who showed great vision and quickness in setting up his blocking. After leaving the game with a knee injury, he wasn’t exactly the same, but he finished with three missed tackles forced on his 17 carries while picking up 50 of his 79 yards after contact. Brown struggled against the run and pass all game long. With numerous unsound fits in the running game, Brown and the Chargers defense struggled, giving up 193 rush yards at 8.0 yards per carry. Brown was targeted 7 times in pass coverage, allowing all 7 to be caught for 72 yards and a touchdown. Ingram was one of the lone bright spots for the Chargers on Sunday, giving fits to T Mitchell Schwartz on a number of plays, including two sacks when lined up across from one another. Ingram finished with three sacks and 4 solo stops.